It’s no secret that Lowell of long ago was more rural, especially in its outskirts – which included the land where Cross Point, Showcase Cinema and Route 3 now sit today. As you drive along Lowell’s Route 110 East today (also known as Chelmsford Street), you’ll cross into Lowell just before you pass under Route 3. From there, you’ll continue past a gas station, a strip mall or two, and local landmarks like Cross Point and Lowes. It’s pretty familiar scenery, even if you’re seeing it for the first time. In Lowell of long ago, however, stately trees once towered over a white picket fence that lined a rural, tree-lined version of this road. Lowell’s City Farm was also tucked into this corner of the city, sharing the crescent-shaped plot of land between Chelmsford Street and River Meadow Brook with the Lowell Water Works, roughly tracing the route that the Lowell Connector runs today, between exits 3 and 4. Victoria Street once extended across Chelmsford Street and provided the main entrance into the City Farm, described by 19th century Lowellians as ‘the break in the white fence’. Rumor has it that that break in the fence was framed by ‘several thousand’ cabbage plants, but the Victorians were known to exaggerate their descriptive facts. At the end of its long driveway, you’d see the buildings of the City Farm, standing roughly where Lowes is today. Its land ran from the present-day location of Route 3, back into the Showcase Cinema area, including land where the 99 and Lowes now sit, and up along Chelmsford Street, almost to Plain Street. Maybe you’ve heard the expression “You’ll send me to the poor house.” Lowell’s City Farm has been gone for years, generations, but it lives on in memory as a shelter of last resort. City farms served as Victorian society’s equivalent of today’s homeless shelters, nursing homes, and mental hospitals. Lowell’s City Farm, its grounds, buildings, and inmates, was often described as clean and neat. It wasn’t lost on many that some of the poor found at the farm were experiencing some of the best fortune of their lives. But, their original purpose, never strayed far from officials’ minds. The city farm’s main purpose was to instill a sense of self-sufficiency in the paupers of the day. “The philosophy of this method of relief [of the poor] is that it tends to prevent total pauperism. The poor temporarily deprived of labor and its fruits are aided until they are able to become self-sustaining once more. If when their day of trouble comes they are removed to an almshouse, that self-respect which separates poverty from pauperism is apt to be broken down and the person relegated to the increasing ranks of public charges. It has been the aim of the Secretary to discriminate between those whose poverty is the result of untoward circumstances beyond their control, and those whose poverty is the result of untoward circumstances beyond their control, and those whose wretched condition is the result of drunkenness and idleness. The former class have been helped cheerfully an wisely, while the latter have been, as far as possible, compelled to go to work or removed to an almshouse. An effort has been made to extirpate chronic pauperism among a class of idle, worthless people.” Joseph Smith, Secretary of the Overseers of the Poor, 1889. Lowell’s City Farm was no small institution. 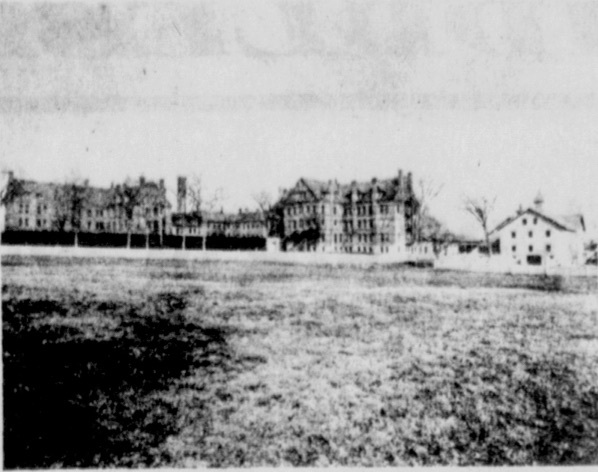 Its 125 acres housed an almshouse for the poor, a workhouse used to imprison criminals, the insane asylum, and “the House for the employment and reformation of Juvenile Offenders in the City of Lowell”. The Almshouse was the largest of the City Farm’s institutions, housing an average of 250 people at any one time during the year. Most came and went voluntarily, staying mostly for the worst winter weather between November and March. About 10% of the poor farm’s discharges came through death, through common 19th ailments like consumption and debility. Most of the insane were kept ‘under lock and key’, but a few were restrained with ‘mechanical apparatus’. A large percentage of the insane were reported to be homicidal or suicidal. The City Farm’s insane population averaged about 75 most years. The workhouse was the ‘house of corrections’ of its day. Housing about 50 inmates at any one time during the year, most were committed for drunkenness. Far fewer found themselves committed there for crimes like larceny, vagrancy, or embezzlement. The “House of Reformation for Juvenile Offenders” functioned as a sort of alternative school for children found guilty of crimes, most often truancy. In 1888, the house of reformation housed 41 children – 40 boys and one girl. If you were to visit the Poor Farm in Victorian-era Lowell, you’d have been surrounded by a lot of old paupers – old by Victorian standards anyway. When families could no longer care for their old or infirm, they went to the Poor Farm, sometimes temporarily, sometimes for the rest of their days. Whether free or detained, sane or insane, poor farm ‘inmates’ followed a rigid schedule believed by their contemporaries to be their savior from a life of dependency on the city. All inmates were expected to rise daily at 5:30 in the morning, and retire each evening at 7:30. All dressed similarly, and slept in dormitories, even if they had been committed there for minor offenses like public drunkenness. They all ate a diet of ‘good, plain’ food. The quarters of those committed there for ‘mental deficiency’ were not quite as ‘commodious’, due to the extra expense that the farm already had to expend on them. The male insane patients worked alongside their sane counterparts in the fields, while the women tended a garden, secluded, and reserved only for them. Today, as you drive along Lowell’s 110, there’s almost nothing left to indicate that the City Farm so dominated this section of Chelmsford Street for generations. The River Meadow Brook, long a key feature of the City Farm’s land, remains, but today finds itself forgotten between the Lowell Connector and the shopping center that hosts Target. You can spy a glimpse of it as you travel along Plain Street near the Connector overpass. The records, a few stories, and fewer photographs are all that remain of an institution that served as a last resort for thousands during Lowell’s 19th-century past. I had heard people talk about the poor house back in the 1950’s but didn’t know the story. Thanks for the report ! “We’re going to have to move to the Poor Farm!” That’s something I do remember Mom saying more than once when i was growing up. I’m in my 60’s now. I didn’t realize at the time that there really was such a place, but i got the message. I’m sure her parents reminded her as well when she was growing up . And they probably actually knew folks who went there.. ..So just do the right thing and get a job as soon as possible..or else you know what could happen! And me and my brothers and my sister did. The threat worked. It’s interesting how, years after it was gone, the threat of ending up at poor farm remained. The directions on the opening paragraph confused me. You are in Lowell BEFORE you go under Rt 3. Nice report in general. I remember hearing the area referred to as “where the poor farm was ” in the 50s and 60s but I never saw any of the buildings. When did they come down? Hi Jim, Thanks for the comment on the directions on 110. I’ll check that wording. Writing this post was challenging because there’s not much contemporary research available out there on the Lowell City Farm. Victorian era writers just accepted that the poor farm was there, way out in the outskirts of Lowell, and kind of ignored it. I’m planning a follow-up post where I’ll go into some of the census-level patient research I found and a bit more on the day to day there. I need to nail down exact dates, but I’d hazard a guess that the poor farm buildings came down sometime in the 1920-1940 range. The Lowell City Hospital and Almshouse was located on Chelmsford St, approximately where the Lowe’s is now. From looking at old maps (which can be found the UMass Lowell’s Center for Lowell History)and reading accounts in old issues of the Lowell Sun (found on the Newspaper archive), I was able to piece together that the amlshouse dates from late in the 19th century, sometime after the Civil War. It gradually evolved from a poor farm to a hospital for indigents. After WW2, there were a lot of requests fromLowell families to name intersections after their sons who been killed in the war. The families of Francis Farris and Joseph Lane vied for the intersection of Pawtucket and School Streets. The honor went to Lane, but Farris got the Chemlsford St Hospital named after him in 1947. By this time, the buildings were apparently in poor shape, because there was talk in the early 1950’s to build a new Farris Memorial Hospital up on West Meadow Road in Pawtucketville, behind the old Isolation Hosiptal (by now known as Meadowcrest Hospital). However, this never happened – I presume for lack of funds. Times were hard in Lowell in the 1950’s and 1960’s with people and industry alike fleeing to the suburbs or to other parts of the country. WIth a shrinking tax base, it was getting harder for the city to support these institutions. The city closed Farris Memorial in 1958. Shortly thereafter, the buildings were demolished and the land was developed as an industrial park. As for Isolation / Meadowcrest, that was closed in 1962, the buildings were demolished, and Pawtucketville Memorial School was built on the site. That’s about all I know…. Ryan, your directions regarding the city line being just before the overpass heading east on Chelmsford St. is exactly correct. The Entering Lowell sign can be seen just before the bridge. Great job on this article! I can remember as a child living across Chelmsford Street on Usher St., that the buildings were still there in the late 40’s early 50’s. We kids would go over and visit the pigs that were in pens behind the buildings. Living in the city, farm animals were not familiar, so we were excited to feed them. Thanks for this article. When my family moved to a house adjacent to the Farris on Wellman St in 1952, the Farris was still operating. I was young, but I recall cows where Lowe’s parking lot is now. A fire destroyed the main building in the mid-1950’s. I’m sure if I looked at an old census I might recognize a name or two. Tough times in those days. Hi Judy, I’m planning a follow-up post where I’ll go into some of the census-level detail. I can send you the census sheets if you’d like. I remember walking by the fence as a child and looking at the poor farm. Thanks for keeping the history of Lowell and Chelmsford alive. So much gets lost nowadays. I am into genealogy and would also appreciate some census-level details. Were there a set of stone steps in the empty field after the tear down of buildings that were the poor farm? There were, along Chelmsford Street – right where the Stairway Plaza stands today. I’ve never heard that they were connected with the poor farm. I remember seeing an article years back saying that they were left there by a contractor from a job that was never completed. The Poor Farm & The Stairs to nowhere. Before the days of the housing in Avenues A,B,C along Chelmsford St., it was a field sloping down to the edge of what we called Hale’s Brook, aka River Meadow Brook apparently today. A great field for running down hill kite flying in the Spring. You could also look across the brook to the mysterious looking Harvard Brewery. On that other side of the brook, you could see a black sided railroad bridge from which you could espy kids skinny dipping in summertime. On winter eves you’d see bonfires dotting the frozen brook. I tried ice skating once, but decided I preferred the warmth of the Hi-Hat on Saturday afternoons and gals in skating skirts vs being in bulky, woolen leggings (not tights of today.) On the south side of the field was a stretch of wild trees leading down to the brook that expanded on its way down to the Poor Farm that was rife with kids (untethered with cell phones) playing Cowboys and Indians…there was even a “humongous”, in those days, boulder titled Cowboy Rock to scamper up. Indeed, the Brook was quite wide if you can envision the Connector covering most of it. It was filled with cattails and other submerged reedy vegetation that if your canvass kayak sank, would easily entangle you and be life threatening…once in a channel/waterway, you couldn’t see the shore! The most common birds were black with red circles on their wings…given the post WWII era and movies, they reminded one of Japanese Zeros! Anyway, the forest/jungle ended at the Poor Farm and “we” only once dared…because of local “mythology”…to creep and peer into the hog sties in the back…there were no pigs that day. Anyway, I left LowellLand for college in ’58. I’m presuming the cute house suffered some kind of disaster and in razing whatever remained and for unknown reasons, the stairs that I might indeed picture as part of its decor/style, were left behind. To complete the circle of my recollection, I believe Wellman St. would lead you down to The Poor Farm. Amen! Thanks for sharing the childhood memories in great detail! Hard to imagine all of that once happened there. Kids need more places like that today. I’ve got a post started on census-level detail. I’ll have it live soon. Those lonesome steps were much newer than the farm .I worked for Wang in the Courier Building adjacent to them . I have a couple of pictures of them and me on them – but still a mystery who left them there . This is a wonderful article – so interesting . Thank you so much for posting it . The “steps” were an advertisement for a pre-cast concrete stair and tank company that had its sales office on that site. Thank you for the information about the steps . Kind of more fun to have a made up mystery but it’s good to know . Ryan, I just came across your piece! So interesting! I have been looking for information about the Farm for the last two years!! I have some information but your piece is full of details! You mentioned you would be doing a follow up article. Would love to read it. My great grandmother past away at the Poor Farm in 1897 and I have been researching her story for the last year or so! Look forward to hearing from you. Thank you! No, AAA stair tread was a subsidiary of the British firm that bought out Lowell Safety Tread in the mid-1960s. They built the new building off Wellman St. at that time. This was about 10 years before the stairs. I worked there for a couple of summers, 1965 1966. The owner was Hugh Siefert. One day in 1966 his lawyer came to visit and brought along one of his other clients, Jack Kerouac. The lot on the corner with the stairs was owned by my uncle, Albert Levasseur. He once had part ownership of Elliott’s in downtown Lowell. He and his wife were childless. They also had a house on Westford Street . Both houses were filled with junk. A nice guy, but very eccentric. He ran for Lowell city Council several times, never winning. Wow That was a terrific article. Spent a lot of time as a kid in that area never new the poor house existed or I just don’t remember hearing about. Now every time i go to Lowes I will be thinking of the poor house. I too spent a lot of time around Chelmsford St. as a kid and never knew of the poor house. Jim did you deliver the “Sun” along with your dog as a kid? Yo Ryan, “Happy New Year” LOL….Just thinking…time to yank your chain: Might you be straining to do an addendum in terms of Tewksbury State Hospital in terms of goals and the indigent….contrasting, overlapping, interfacing? Hi Bob – that might be an interesting post. I have an older post on the Billerica poor farm, which isn’t far from the Tewksbury line. I’ll look into a Tewksbury Hospital post. Wasn’t there a poor farm in chelmsford too? Not too far from the lowell one? At the corner of billerica rd. and 129. Where the barn and old house on the corner? I heard there’s even people buried there from the farm? Steve, I believe the Poor Farm was on the Lowell/Chelmsford line. It was in the area of where Cross Point and Lowes is today. It was an extensive farm covering an area of about 160 acres. I am not familiar with one in Chelmsford or in that area. I’m guessing where the Poor Farm was so close to Chelmsford line there was only one. Mary I believe your right about the poor farm in Chelmsford. I grew up not far from there and my grandmother and great aunts talked about the farm. I know I have read about the farm in articles about Chelmsford but could not tell you which ones. I am sure the historical society would know. Well gosh darn it! Some of y’all seem to have good memories. As such, thought you might enjoy participating here http://tinyurl.com/ycndtmt7 about LowellLand as well. Been to Elephant rock many times. Also Cowboy rock (Daley School woods). I was told the white stairs were owned by the Wilde twins (Forrest Street), whose family originally owned the house. (I can’t vouch for this, but this is what I was told). There was a big abandoned house near (/next-to?) the stair house, which was knocked down to build the Scopus building in the 80’s. We used to go into that house sometimes – very spooky. I remember there was still silverware in the draws. We dared each other to go into the cellar (dirt floor, zero lights, way too spooky). If you went down past Elephant rock, you came to a feeder to Hales brook that went under the Connector. There were lots of crayfish in there. We used to to towards Industrial Ave on the brook and skinny dip sometimes (pretty risky since you could see us from the Industrial Ave bridge if you looked when going over it). I ended up working at Wang in the 3-story towers adjacent to this property many years later – I often reflected on my younger years spent right in that area. I had a morning paper route (first Herald American, later Boston Globe) that ran from the intersection of Chelmsford/Stevens street all the way to Plain Street. I went to Saint Margarets school, and had to make sure the papers were delivered before I got to school (rain, snow, … etc). I even had to deliver papers when snow closed the schools!